“I was a shy kid, but I just knew I wanted to be part of something new, something different,” said Valentin. It’s a mantra that has marked the course of the next 17 years. Today, Valentin is a member relations advocate at Baxter Credit Union, and is a graduate of the Rochester Institute of Technology for Industrial Design with major in Industrial Design and a minor in American sign language. He recently graduated with a MBA in International Global Studies and Marketing from North Park University in Chicago. 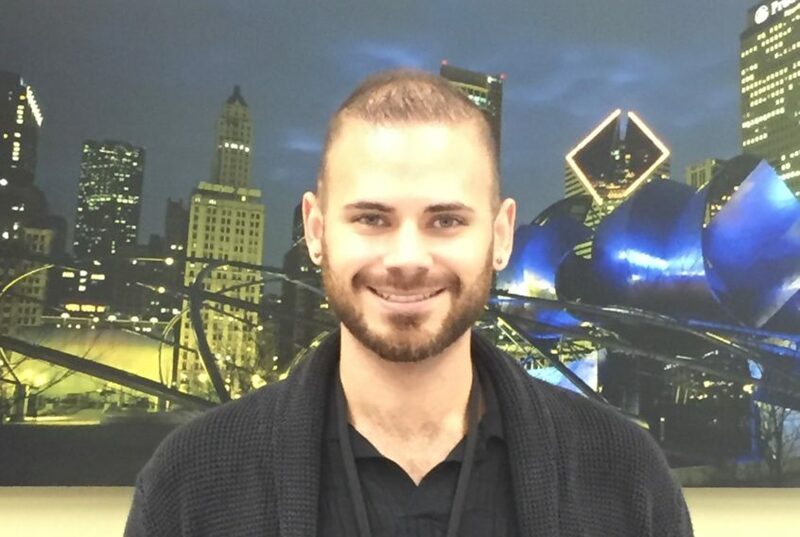 Following his college graduation and while attending grad school, he worked at Cristo Rey for a year as a coordinator for the Corporate Work Study Program, the first step, he says, in giving back to young people in Waukegan. A born trailblazer, Valentin is also a published poet, painter, photographer and overall involved in the arts. During college, he was a member of the touring dance troupe for students who are hard of hearing and deaf and he studied abroad at the Florence University of the Arts. He speaks four languages including Spanish and Italian, and he says, sign language. He became interested in that because his cousin is deaf and because he has many friends who also have lost their hearing. It’s the lessons about working hard, paying attention and being super resourceful, that he says have propelled him on his journey to attend school, work to earn the funding and to pursue his passion in the arts. His second life-changing lesson was overcoming what he says was his crippling shyness. At Cristo Rey, he joined the Cross Cultural Club and the Gamer’s World Club to pursue his fascination with faraway countries and to become part of a group of friends at school. “I was beyond shy and never had pushed to be part of anything,” he says. That effort to reach out and make friends, coupled with his new Corporate Work Study assignment at the front desk of the Village of Gurnee pushed him out of his comfort zone and led to year-round employment during summer and school breaks. He remembers the big send-off his co-workers had for him when he left for college in New York. During college, Valentin also received an associates’ degree in Advanced Mathematics, joined a fraternity Kappa Delta Rho, helped teach hip hop as a teaching assistant, was a resident advisor for his fraternity, the international student floor, and one year on the a deaf and hard-of-hearing floor. “I made sure I was very involved and nowhere near shy like I was as a kid,” he says. To help pay his tuition, he worked at the school grocery store and at the front desk for a tutoring center. He’s thought about what his life would be like now if he had not attended CRSM. Today, he’s thrilled to be back in Waukegan with his mom, dad, two sisters and his four-month-old niece – and his two nephews. Future plans call for a PhD, but for now he is happy to be working at Baxter and checking off items on his dream board and traveling the world. Valentin is very grateful for the experience and opportunities CRSM has opened up for him.